Glooko announced pump and CGM integration partnerships today with Dexcom and Insulet. The next generation Glooko platform (iPhone/Android apps and a web dashboard) will roll out this summer and include access to data from both devices. Glooko announced pump and CGM integration partnerships today with Dexcom and Insulet, expanding its historic diabetes device focus on BGMs alone. The next generation Glooko platform (iPhone/Android apps and a web dashboard) will roll out this summer (this was fast!) and include access to data from both devices. 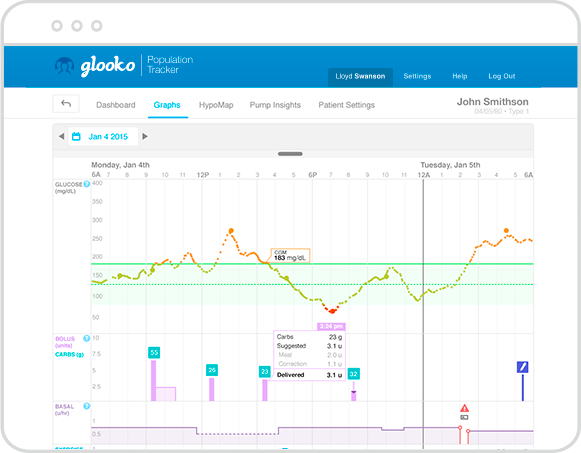 Today’s news was not a major surprise, as the March news of Glooko’s $16.5 million in funding first announced CGM/pump integration plans (as a reminder, Medtronic was a first-time investor in the Series B round). See the screenshots below for some of the new dashboards – the interface looks terrific, with a colorful, unified layout prominently showing time in range (yes! ), CGM modal day traces, insulin doses/pump data, BGM values, exercise, and logged carbs. OmniPod and Dexcom data will be downloaded to Glooko via a micro-to-micro USB OTG cable – patients will do this via their own Android phone (direct iPhone download is still in development), or clinicians can do this using a kiosk Glooko provides. Notably, Dexcom Share receiver users with iPhones will also be able to send their data straight to Glooko’s platform via Apple’s HealthKit – we’ve tried this for other apps like mySugr and found the Dexcom import to be low hassle (it just requires authorizing Dexcom Share to “write” glucose data to the Health app, and authorizing another app to “read” that data). This pump/CGM news adds to Glooko’s impressive device compatibility with 30+ BGMs, popular activity trackers, and blood pressure and weight measurement devices. The added functionality will be available for both the consumer and clinic/health plan Glooko subscription models. As a reminder, the consumer version was soft-launched in March at a price of $59 per year. That seems like a pretty good deal for patients, though as another reminder, many patients are loathe to pay for anything (they haven’t been well trained). The clinic version, by contrast, negotiates contracts with payers/health systems, which give the Glooko system to patients for free.] A major emphasis of the announcement is Glooko’s risk-stratified population tracker, which enables providers to see all their patients in one web interface and pinpoint those in trouble – we increasingly believe diabetes care delivery needs to go in this direction, particularly as healthcare reimbursement changes to ACOs and more bundled payment models. Glooko has a meaningful presence at ADA this week – in addition to its own booth, the company will have demos at the Insulet booth, which we assume will be quite busy with the expected debut of the new Bluetooth-enabled, touchscreen OmniPod PDM. It was notable to see today’s press release quote both Dexcom CEO Kevin Sayer and Insulet CEO Patrick Sullivan – both signal that data management is of critical importance at the highest levels of management. Most of all, this is good news for patients and providers, as it will make downloading and unifying disparate data sources that much easier – it’s really starting to feel like the proprietary company data siloes, software, and cables are going by the wayside (as they should). These partnerships also set Glooko on the potential path to the more important step two (and focus of HCT’s Diabetes Data Innovation Initiative, announced on Monday): advanced decision support software that enables patients and clinicians to take meaningful action from the overwhelming data being generated. Dexcom has been the most forward thinking device maker on the data-sharing front, and Glooko compatibility adds to a slew of existing data partnerships: Apple, Diasend, SweetSpot, Tidepool, and apps (Databetes and Training Peaks thus far). Dexcom listed Glooko as a partner back at JP Morgan in January, though Glooko decided not to announce the official relationship and integration until it was close to complete and ready to bring to market. We assume Dexcom’s Gen 5 will also be compatible with the Glooko system, as it should just pull data directly from Apple’s HealthKit. As a reminder, Gen 5 will have an optional receiver, but the transmitter will send data straight to the mobile phone. An FDA approval of Gen 5 is expected by the end of this year. Presumably, Insulet’s new Bluetooth-enabled PDM will also be compatible with Glooko, once it launches. Insulet has plans to integrate its PDM with the Dexcom Gen 5 app, and we wonder if a download of data from HealthKit might be possible as well. The PDM is expected to be unveiled at Insulet’s booth this week, and an FDA filing is expected by the end of the year. Diasend and Tidepool have long promoted integration of pump and CGM data, and we hope to compare all three platforms this summer to better understand the pros and cons. Diasend is currently available to patient and clinics and compatible with pumps/CGMs (Animas, Dexcom, Insulet, Roche, Tandem) and many glucose meters. Meanwhile, Tidepool’s Blip and Device Uploader are in beta and set for public release this summer. All three platforms are working on a critical issue (making it easy to download), and we wonder how the organizations will differentiate (decision support?) or perhaps work together in the future. There is certainly plenty of room for multiple software platforms to co-exist in diabetes, and we imagine patients and clinicians may prefer one vs. another depending on the personal preference and their particular devices and circumstances. The organizations’ business models also differ – Tidepool is a non-profit and will offer its platform to patients and clinicians for free (relying on donations, and potentially revenue from manufacturers), Glooko is for-profit with the aforementioned consumer and clinic/health system subscription models, and Diasend charges clinics but offers its software free to patients. Glooko has added a ‘Pump Day View’ and ‘Pump Insights’ reports as new functionality to its platform. The ‘Pump Day View’ shows a patient’s basal and bolus insulin records, carb intake, exercise, and glucose readings from the patient’s CGM or blood glucose meter – that is shown below. The ‘Pump Insights/Settings’ view provides clarity on the impact of pump suspends, temporary basal events, and site changes on blood glucose levels. This should be incredibly useful information for patients and providers. These CGM and pump integration partnerships required a “note to file” off of Glooko’s current FDA clearance. In development, Glooko also ran a set of user and clinician feedback sessions at Joslin and Children's Mercy in Kansas City. Certainly, the heavy involvement of Joslin’s Dr. Howard Wolpert has always been a huge plus for Glooko on the clinical side and has added major credibility to the young organization. This news follows Glooko’s $16.5 million in series B funding in March (investors included Medtronic, Canaan Partners, The Social + Capital Partnership, and Samsung). The company has raised $27.5 million in total funding to date. The Social + Capital Partnership is one of the leading healthcare investors in Silicon Valley and was an early investor in Dexcom. As we understand it, Glooko could have raised another $5 million from its existing investors, but decided to cap the round off. This round of funding is a sign of continued investor interest in data management software as a business and growth opportunity. At the time, the plan was to use the funds to add CGM, pump data, and personalized predictive algorithms to Glooko’s device-agnostic platform – certainly, things seem to be proceeding on schedule! The company now has 28 employees and a few more are joining in the coming month.